There wasn’t an empty seat in the house as the Tropicana Hotel in Atlantic City played host to a sold out crowd for Lou Neglia’s Ring of Combat 46. The fight fans enjoyed over ten bouts of non-stop action as fighters brought everything to the cage in a raw display of pure MMA talent. 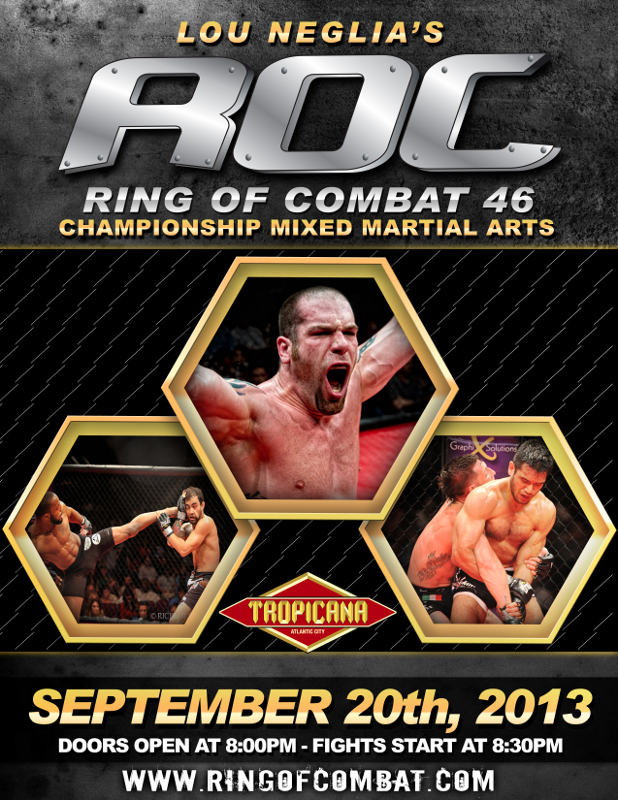 ROC, again, lived up to its reputation as the American Idol of MMA by finding unknown but talented fighters and this was all evident as ROC 46 was one of the most successful shows in ROC history and has been dubbed by media in attendance as the BEST ROC SHOW EVER! Future stars emerged in this show testing and developing their great skills as they continue on the road to stardom. It has always been ROC’s mission to continually test, develop and provide a stage for fighters to display their skills to make a name for themselves in the world of MMA. ROC alumni include Matt Serra, Frankie Edgar and current UFC Middleweight Champion Chris Weidman to name a few. Julio Arce (3-0) def. Corey Simmons (5-4) by sumbission (RNC) in rd 2.
Who do you think is the next ROC fighter into the UFC?